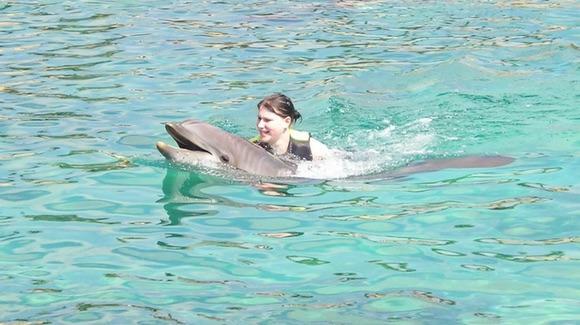 The highlight of any visit to Discovery Cove is the optional swim with the Atlantic bottle-nosed dolphins. Dolphins hold a very special place in peoples hearts and most people find it a very moving experience and cannot wait to do it again, despite the price. At the start of your visit, when your guide leads you down to the lockers and the area where you collect your wet gear, they will point out the particular cabana where you must meet if you are taking part in the dolphin swim. Make sure you keep an eye on the time as you must be there for your specified time slot. Make your way over to the cabana at the appropriate time for a 15 minute pre-swim briefing where the trainers will show you a film about the dolphins and their habits. They will then teach you how you can communicate with the dolphins using hand signals and give you important safety tips (adult dolphins typically weigh around 500 pounds). You are then taken in groups of six to eight people out to one of the dolphin lagoons to meet your allotted dolphin. Remember that even though this is a very controlled encounter, the dolphins do not always want to play. On our visit, the first dolphin Ruby wasn’t interested so in the end the trainers called another dolphin Diego over instead. For most of the next 30 minutes you are stood in shallow water whilst the trainer gets each of you to interact with the dolphin using various hand signals and touches. Note that the water is quite cool so you may feel a little chilly during this time. Towards the end of the swim, you are taken out into deep water by one of the trainers where you get the opportunity to be pulled along by the dolphin by hanging onto its dorsal fin. This is the only point of the encounter when you need to actually go out of your depth and if you are not a confident swimmer it is worth putting on a life preserver for this particular part of the swim. You can take if off again once you are back in the shallows. At the end of the swim, the dolphins will put on a group show specially for you and then you make your way back to the cabanas for a wrap up session and the opportunity to order photos or videos. Because of its very structured nature some people do not feel that this is really a swim with a dolphin in the strictest sense but it is a very good opportunity to get up close, to touch and even kiss a dolphin and you are guaranteed 30 minutes with a dolphin and qualified trainers. If you do not want to pay the high price of the souvenir photos and videos, get one of your party who perhaps isn’t swimming to take photos from the waters edge. If you do buy a video or DVD from Discovery Cove make sure it is compatible with your own video/DVD player - see the practical information page on DVD and video formats. Throughout Florida there are other companies offering different types of dolphin swims and dolphin encounters - see the practical information page on dolphin swims and dolphin encounters.